During the late 1830s, several French Canadian lumberjacks passed through this part of what was then known as the Huron Tract. These men, Claude Gelinas, Abraham Bedard and Baptiste Durand returned to family and friends in Quebec with reports of a lake “lousy with fish”, a pleasant climate and advantages offered on land purchases by the Canada Land Company. These positive reports combined with the economic difficulties in Quebec at the time (successive crop failures; high prices; lack of jobs) made the prospect of a new life along Lake Huron’s shoreline an attractive option. The journey from rural Québec to Lake Huron’s shores was a challenge. They travelled by boat from Montréal to Hamilton and then overland along bush roads through forest, swamps and marshes. Some settlers had ox-carts that carried their possessions and younger children; typically, older children and adults walked alongside the carts. Others with more financial means hired coaches to travel along the first, rough roads, settlement to settlement. The coaches would have bounced and lurched along what amounted to little more than dirt tracks. And all of this through mosquito-infested Southern Ontario during summer months. After two to three weeks, the settlers reached Stratford. From there, some families continued on to Goderich (Mousseaus; Cantins), travelling the Canada Land Company’s road – today’s Highway 8. The majority of settlers turned off the main road at Seaforth, coming across to Brucefield and south to Bayfield and others further south to the area of today’s St. Joseph. Since there was no road south of Bayfield, the settlers walked along the height of land above the beach or along the beach, until they reached what’s known today as Ducharme’s Beach. This group of seven or eight families made rough hut-like shelters on the beach from bark and boughs of nearby trees. That night they endured one of Lake Huron’s famous convectional thunderstorms that churned up storm waves and blew down the crudely-built huts to expose the settlers to drenching rain. According to local narrative, the first breakfast consisted of lake fish and berries. Over the next few days, half-acre and one-acre lots were staked and log shanties built. The settlement, nestled on the bank above the beach, was named “Points-a-Bouleau” (point of land covered with white birch). The settlement remained in place for six or seven years before the settlers took lots along the new lake road opened in 1849 and today known as Highway 21. The life of these French-Canadian settlers was typical of pioneers in other parts of Upper Canada. Map of St. Joseph – 1879 shows lot designations. Many of these French-Canadian settlers family names remain today. They purchased land from the Canada Land Company for about $3 an acre, which then needed to be cleared for crops and livestock. Homes were made of logs, using mud to block drafts instead of mortar and bark or small logs for roofing. Open-stone fireplaces were used for heating and cooking. After land had been cleared and the soil broken using spade, plow or dragging heavy tree boughs over the ground, the first crop sown and harvested was buckwheat. Home-made sacks were used to carry harvested grain to McConnell’s Mill at Francistown for grinding to flour. Francistown is now the north part of Exeter. This was a fourteen mile (22km) journey carrying hundred-pound (45kg) sacks. Generally, two men would take turns carrying the sack. Buckwheat flour was reserved for special occasions, while the daily diet consisted of fish, wild fowl, game and berries. Even after fifteen years, life remained difficult. The settlers were helped by their English and German neighbours inland. Stories have been passed down of prosperous settlers bringing wagonloads of food to the poverty-stricken French-Canadians along the lakeshore. By the 1860s, the acreage in crops had increased and the settlers took their grain to Seaforth or Goderich, where they would exchange it for goods or have it ground to flour for their own use. Like most pioneers, they purchased no more than necessary from merchants. As much as possible, furniture, implements, clothes, soap, candles and mattresses were home-made. During one particularly bad crop year, known as the Famine Year, settlers were forced to survive on pigweed and roots, with several settlers actually dying of starvation. If natural food supplies (fish, birds, deer) had not been as plentiful as they were, this fledgling settlement would likely have disappeared. These settlers left Quebec because of poverty. Their experience in the Huron Tract was not much different for at least 60 or 70 years. Small surpluses gathered from farming, fishing and home industry were sold in Goderich, Seaforth or Francistown (Exeter) – the nearest settlements of any size for 10 to 15 years. Some economic development did take place closer to home. In the 1850s, Moses Johnson built a sawmill on the lake road (Highway 21) near where the creek enters the lake, a short distance south of the Zurich Road (Highway 84). By 1860, Zurich had developed to become the principal market centre for the settlers. They brought their grain to be processed by Fred Knell’s grist mill, instead of trekking further inland to Exeter. The Zurich market was a place to sell their produce – straw hats, eggs, butter, apples, fish and other home-made goods. From Zurich’s merchants and blacksmiths, they bought clothing and manufactured items. By the 1870s and 1880s, the community had become more economically secure. Although the farms were smaller on average than other Hay or Stanley township farms, the land did provide a subsistence living. In 1896, the town of St. Joseph was established. A town site called Lakeview is included on the early maps (registered in Goderich on March 17, 1857), but never developed beyond what was already in place during its Johnson’s Mills stage, plus a tavern called the Lakeview Hotel (opened 1874). Like today, Lake Huron contained whitefish, lake trout, sturgeon, pickerel, suckers and other species that were fished in large quantities by fishermen from Grand Bend to Goderich well into the first two or three decades of the 20th Century. Fishing remained an important source of income until the 1920s. Financial prosperity did not come until the introduction of white beans as a major cash crop in Huron County. The community’s economic history has been one of emergence from subsistence farming to the more typical mixed farming found in Huron County. Fishing, woodcutting and other labour provided additional family income. For a time, the enterprises of Narcisse Cantin and his associates in the Town of St. Joseph provided more jobs, but this period of more diversified economic activity was brief. Like many small towns, community and social life centered around the church. Dances with fiddlers and other forms of entertainment characterized the area. Folk songs and social customs of rural Quebec persisted for generations, such as the New Year’s Day tradition of gathering in the father’s house for his blessing. Jobs were often turned into games. One story tells the need to move a large anvil from a barn in St. Joseph. Narcisse Cantin provided the amusement by offering $50 to the man who could lift the 410 lb. (186kg) object to his shoulder (annual wages at the time were about $453). There were several unsuccessful attempts, including one by a Black-Canadian man named Mousseau. Mousseau succeeded in getting the anvil to his shoulder, but the effort was too much and he dropped it. The anvil then crashed through the barn floor killing a calf below. Cantin paid Mousseau the $50 and paid for the calf as well. Development in the area remained rural. 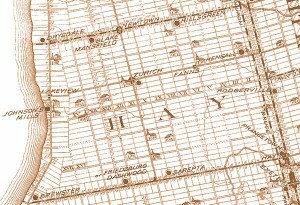 No town was founded, although the Lakeview Village plan was registered in Goderich on March 17, 1857 Mr. Coe. The junction of the lake road (Highway 21) and the Zurich Road (Highway 84) was to have been the main corner of the village. Village streets were laid out north and south parallel to the lakeshore. In 1896, urban development was given a beginning by Narcisse Cantin with the establishment of what was to become the City of St. Joseph. In the 1850s, some settlers were cutting wood on Canada Land Company property. This was likely the result of poor boundary markings or the fact that these farms were very small parcels of land, forcing wood-cutting beyond established lot lines as a necessity. Canada Company officials charged the settlers with theft and threatened prison. Father Sneider, who was the area’s missionary priest at the time, spoke to Goderich lawyer Malcolm Cameron. Cameron was a Liberal and a Protestant, but also a close friend of Father Sneider. Cameron pleaded the settlers had acted out of necessity and won. Afterwards, each time Cameron ran for parliament all of the French-Canadian settlers voted for him. The area then became a Liberal strong-hold. In municipal politics, the French-Canadians did not appear to take an active role. Hay Township was incorporated in 1846, the year the settlers arrived in the area. Records of township officials throughout the 1800s do not contain any French-Canadian names.